Earlier this year we heard that the Sleepy Hollow writers had more surprises in store for us that we’d never see coming. Between Ichabod and Katrina’s romance getting cracks and Henry being shown as NOT as in control as we all thought he was, let the surprising revelations will start to begin. Considering he’s the poster child for chivalry and old world charm, it comes as no surprise that Ichabod draws the attention of quite a few ladies. Though it is one lady in particular that seeks to punish him and all those close to him. It turns out he didn’t just leave his family when he defected to the Colonies; but also the woman he was ‘promised’ to. That being said, Ichabod still handled everything properly and broke off his engagement when he left for the America’s; but his former paramour – Mary Wells – couldn’t accept that. After following Ichabod to the colonies, she couldn’t believe that he’d side with the rebel colonies rather than return home with her. She immediately leapt to jealousy when seeing Ichabod speaking to Katrina – who was then still engaged – and seemingly left to return to back home with no hard feelings. 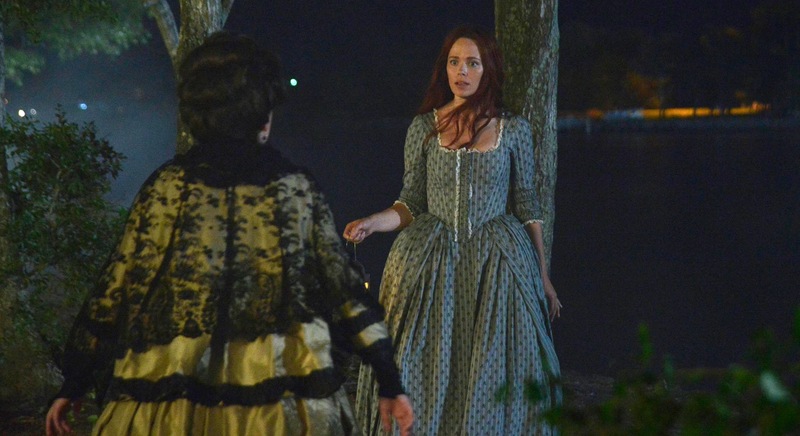 So how is it that Mary became a LITERAL green-eyed wraith dead set on drowning any woman who tries to get close to Ichabod? We know Henry gave her corporeal form in order to turn this spirit of mourning into a spirit of vengeance; but WHY is she here? As it turns out, Mary didn’t go back home but instead fell to her death after trying to push Katrina off a cliff. Katrina couldn’t bring herself to tell Ichabod because she knows he would have been racked with guilt and returned home to explain everything to their families. 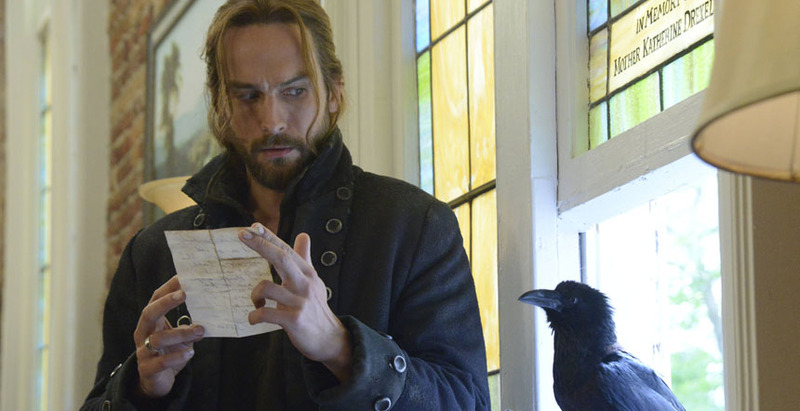 This could have also resulted in Ichabod not being able to return to the colonies. So between her growing love for him and his role as ‘witness’, she couldn’t let him go. With Ichabod pissed at all the things Katrina never told him and Abraham offering a kind shoulder, it looks like the bond between Ichabod and Katrina is slowly breaking. Moloch seems very interested in Katrina due to her status as a “hellfire shard” – whatever that is – and he will get her one way or another, whether willingly or as the aftermath of a forced binding ritual. We might not know what twists are coming this season; but we always had a strong feeling it would be part of Henry’s larger plan. That the master of deception was going to somehow lay another trap which would take us all by surprise and reveal just how in control he is. Though in a classic Sleepy Hollow twist, it turns out Henry isn’t as in control as we thought. He’s not the man nurtured and born again by darkness; he’s the child revived by darkness. This might seem like an obvious choice –considering the constant reminder that he is the CHILD of Ichabod and Katrina – but we are so used to see him as the elderly man pulling the strings that we never stopped to consider the fact that he is nothing more than a child acting out. We’ve seen bits and pieces of this thus far, such as his holding onto the room he was born in as well as his passive aggressive jokes to his father about making him proud that he’s a lawyer; but this episode really drove the image home. Despite Death telling him not to interfere, Henry still got involved because ‘he likes making his parents suffer’. It doesn’t matter how much this could ruin the plan, Henry is still a child just acting out for attention; and he got it – though not the kind he was expecting. Moloch was LIVID with Henry and reminded him of his place as merely a soldier and not a planer. Once Henry returns from his purgatory chat with Moloch, we see him crying on the ground – sitting rather oddly. It’s strange to see a grown man sit like that; but imagine it as a crying child and it all makes sense. Seeing Henry broken and crying on the floor showed us that Henry might not be as in control as we first thought. The way this whole Moloch/Henry exchange happened made it seem like Moloch was Henry’s father, scolding the impudent child who just wanted to help by meddling in things he could never understand. Beyond all of these things, Hawley again made an appearance this episode although his allegiance is getting more and more confusing by the second. Was the guy he had to see “about a thing” another one of Henry’s men? Is there something still going on between him and Jennie Mills? Did he hesitate at first because he’s starting to like Abbie? We’ll get more of these answers as we go onward; but for now, all we can do is wait and see what happens next.